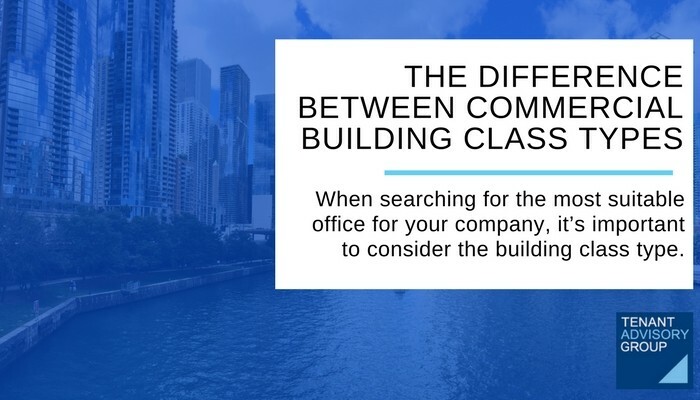 In commercial real estate building class is an important factor to consider when determining which sort of office will be most suitable for your company. While one building may seem comparable to another, upon closer analysis, frequently they will be quite different. Office buildings are classified into three categories (A, B, and C). While standard of class qualification is largely subjective, there are some general guidelines to determine class. The class can be determined by age, amenities, technology capabilities, quality of HVAC systems, landscaping and how well the building has been maintained. Class A: These buildings are considered the highest quality available and state of the art. This is due to their modern architecture, sound infrastructure, well functioning HVAC system, professional management, tighter security and altogether well manicured appearance. Generally, these buildings will be under 10 years old. Thus, a Class A building or office space will be the most expensive. Class B: These buildings are still high quality, but may be a little out-dated. The average age will be between 10 and 20 years. Even in this case many tenants and/or landlords find these buildings to be a good investment. The technology capabilities may not be best in class, but typically will suffice. Security may or may not be on staff and typically it is not required to check in, in order to reach the space. While the amenities of Class B spaces rank average, with some faÃ§ade work, a bit of interior redesign, along with an upgrade in management these buildings and spaces have the potential to be converted to a Class A status. Class C: This class varies depending upon location (city, suburb, town, etc). These buildings are generally 20 years old at minimum. Some may be well kept, however, normally these buildings will lack many modern amenities. Technology will be lower quality and the HVAC system may not function well. In addition, this could include old elevators and mechanical systems, moderately run-down parking lots, and out-of-date furnishings. These buildings will not have security staff or food available on the premises. As a tenant broker we are the proverbial parent and our clients, the tenants, are our children. We want to ensure that they’re safe, warm, and well protected with a strong roof over their heads and an even stronger lease. 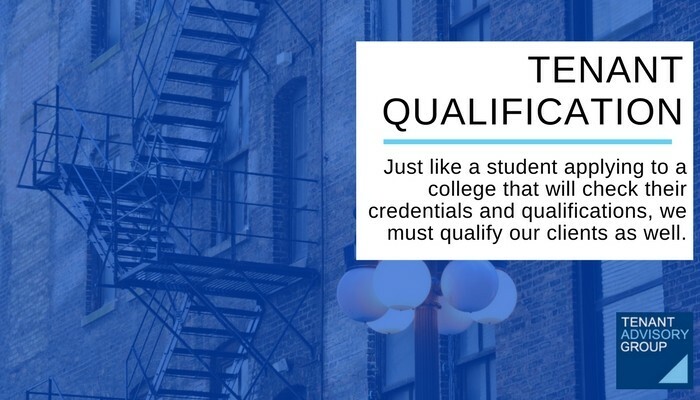 Just like a student applying to a college that will check their credentials and qualifications, we must qualify our clients as well. This allows us to get to know them better and to better understand their financial situation. The most important thing in qualifying a new client will be the financials. Very simply, a landlord should be viewed similarly to a bank. The landlord is going to invest significant funds into a transaction. Like a bank, the landlord wants to know that they are lending (in the form of tenant improvement dollars, free rent and leasing commissions) to a financially stable company able to pay the rent. Many people are under the impression that leasing commercial space is like leasing an apartment- as long as they have good credit they will be in good shape. The main difference is that that rent for an apartment is typically far less expensive than the rent for office space. The landlord cares far more about whether they have growing revenue streams, a strong balance sheet, or have been a stable business for a long time. Having good credit provides no guarantee to a landlord that the tenant can pay the rent every month and on time. Landlords, like banks, want to see income, profitability, cash flow, or at a minimum, financial backing. Without an operating history, without positive cash flow and/or a strong balance sheet, or without a large cash balance in a bank account, a landlord will be reluctant to enter into a lease with that business. Another important qualification question is: does the potential client have an accountant, an attorney and an existing banking relationship? Having these relationships signifies a robust company where others have invested their time.